Independent Options has marked its 40th anniversary with a huge summer birthday party, but has even more reason to celebrate after the fundraiser raised a phenomenal £1,575.11 – the highest amount raised by an event held at the Hazel Grove-based charity. The day was a fantastic success, with the bright sun shining down on the event that saw guests enjoy fairground rides, a delicious BBQ, balloon animals, face painting and games throughout the day. There was a special guest appearance from the Mayor of Stockport, Cllr Linda Holt, and consort Mr Ken Holt, who enjoyed looking at what was on offer and chatting to guests. 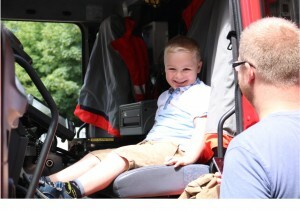 Also making a rather dramatic appearance was a fire engine from Offerton Fire Station, which opened the doors to its cabin for youngsters to sit in and explore. The event raised much needed funds for Independent Options, one of the leading charities for children and adults with disabilities in Stockport. Independent Options’ Fundraising Manager, Lucy Sawdon-Molloy, said “The Summer Birthday Party was a huge success, not only did we raise more than £1,500, but it was truly a fun-packed day. Holding a garden party in the summer has long been a tradition for us here at Independent Options, so it was delightful to see everyone coming together to enjoy themselves in the sunshine on this special occasion. For more information about events held by Independent Options, visit our Facebook page, or our events calendar.